January is Poverty in America Awareness Month. The awareness ribbon color for poverty is white and, as is typical for January, our world is VERY white here in New England right now! 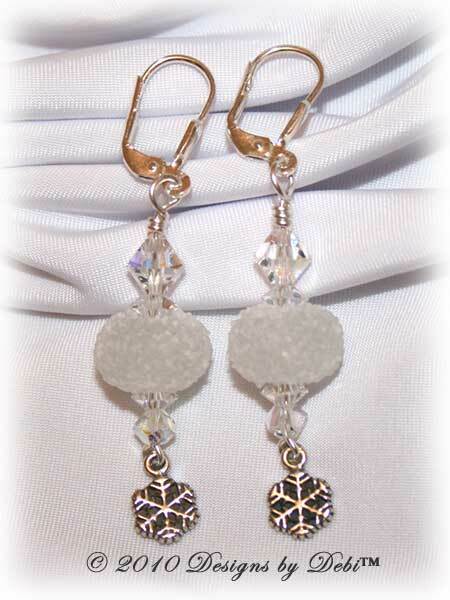 So I decided that a white, snow-themed set of jewelry would be just the thing for this month's Jewelry for Charity. Ironically as you may know, I absolutely HATE snow...but I do love white AND those twinkling Swarovski® crystals so creating this set was great fun!! New Bern, NC. These sugared snowballs and white pixie dust beads were perfect. I included sterling silver stardust beads to add to the snowy effect. 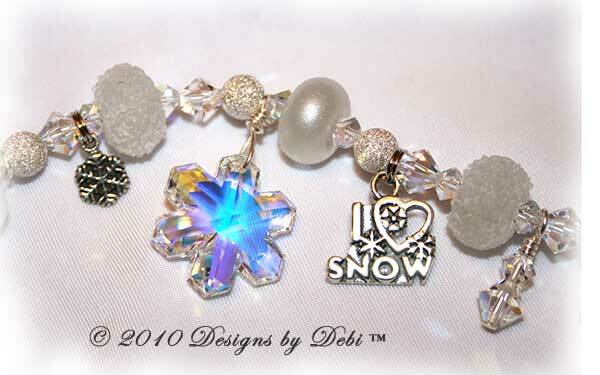 Sterling silver "I ♥ Snow" and dainty little snowflake charms hang playfully along the length of the bracelet. There are also 2 shimmering Swarovski® Crystal AB (aurora borealis) snowflakes for you to enjoy. Swarovski® Crystal AB bicone and simplicity crystals are used throughout the pieces, mimicking how sunlight glistens on white snow. 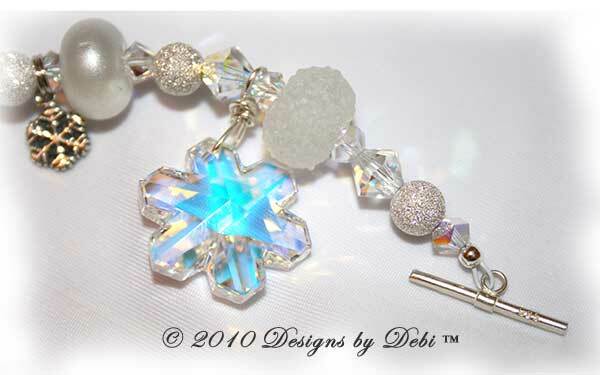 The bracelet closes with a snowflake toggle clasp and three dangles hang near it to add to the fun. The charity I've selected to receive the donation from this set of jewelry is Feeding America. I am a huge fan of The Biggest Loser (shout out to Bob, Jillian and Ali...you guys are the best! !...keep up the great work!!) and it was through The Biggest Loser's Pound for Pound Challenge that I first heard of Feeding America and the important work they do. Feeding America is the nation's leading domestic hunger-relief charity. They have a network of more than 200 food banks serving all 50 states, the District of Columbia and Puerto Rico and through this network they provide food to more than 25 million people each year. Every dollar donated to Feeding America helps provide 9 pounds of food and grocery products to men, women and children facing hunger in our country. Hunger is a reality for many Americans...one in eight...in every community, even in our own backyards. It isn't only a problem for those struggling with poverty or homelessness; college-educated, working adults and their families are dealing with hunger every day. I chose a food charity in honor of Poverty in America Awareness Month because nourishment and nutrition are necessary for the proper physical, cognitive and behavioral growth of children and vital to everyone's health. Without our health, we have nothing. And having the nutrition and energy from food is a necessary building-block for anyone to even attempt to free themselves from a life of poverty. Let's help each other. We are the most powerful nation in the world...poverty should not exist here. To find out more about Feeding America or to make a donation on your own, go to www.FeedingAmerica.org. And if you think you know the facts about hunger in America, take their Hunger Quiz ...the facts may surprise you! 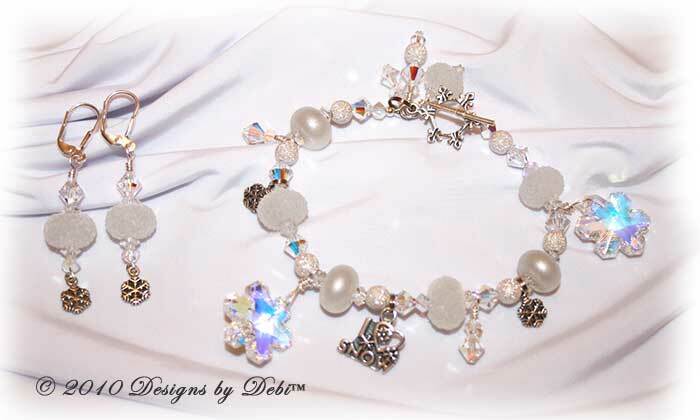 The bracelet measures 8 1/4 inches and will fit a 5 3/4 inch (very loosely) to 6 1/4 inch wrist. The earrings are 2 1/8 inches long. If you need the bracelet re-sized, please let me know at time of purchase and this can be done prior to shipment at no additional charge.